To address the complex systemic problem of supporting people with a severe and persistent mental illness, the Australian federal government established an initiative named ‘Partners in Recovery’. This initiative is aimed at bringing all stakeholders in the service system together to develop innovative solutions for this problem. Hunter Partners in Recovery (PIR) realised that when you keep doing the same thing, you will keep getting the same results, and therefore decided that a new approach to developing solutions for this problem was necessary. They therefore approached us to provide a design process for developing these solutions. Through PIR many different stakeholders were involved in the project, including people with a severe mental illness, their carers, mental health professionals, emergency departments, ambulance paramedics, police officers, housing services and NGO’s. At the start of the project, my colleagues Rodger Watson, Lucy Klippan and I used various design research techniques to make these people talk about what is important to them and how they experience and feel about the way that people with a severe mental illness are currently supported when they are in acute need for help. A core element of the practices of expert designers is their ability to reframe problems and through that to develop innovative solutions. In my previous blog I wrote that Kees Dorst found that when expert designers frame problems, they engage in a deep exploration of the ‘themes’. Themes are relatively ‘stable’ human values and meanings that are shared by multiple stakeholders. When we started analysing our stakeholder data we found several of these reoccurring themes. One of the key themes was ‘drive’. Service providers indicated that people in the sector in general have a drive to make a difference. For example ambulance paramedics told us that ‘there is no better feeling than saving someone’s life’. The next step in the frame creation methodology is to explore the themes. We ask ourselves the question ‘what does this theme mean?’. One of the exercises we usually engage in, is to ask people to share personal experiences of this theme. We then try to find the structure or pattern in the experiences. When exploring the theme ‘drive’ I was for example thinking about my own drive to organise dinner parties, as I love cooking for friends. My experience of this is that first I feel like cooking for friends, I then invite them and cook a meal, next they usually tell me whether they liked it, which gives me a sense of achievement. This sense of achievement in turn sustains my drive to organise a next dinner party. From sharing experiences like this we learned that a part of the structure of ‘drive’ includes a feedback loop to sustain the drive. If my friends would not show any signs of how they liked the meal I might not be inclined to continue organising dinner parties. At this point you might be starting to think: why are we suddenly talking about cooking? Weren’t we supposed to solve the problem of supporting people with a severe mental illness? That’s exactly the underlying idea of working with themes in frame creation. When we explore a theme outside the context of the original problem, we can search for a structure which allows us to understand and reframe the original problem. Such a new frame then opens up new directions for solutions. In this case we found in our research data that the feedback loop of ‘drive’ is virtually non-existent amongst many people who provide support for people with a severe mental illness in case of a crisis. Ambulance paramedics for example mentioned that they had very limited options of helping someone with a mental illness and did not know if what they did was effective or not. And a police officer mentioned that if they do not hear from a person again they conclude that one of three things happened to them: 1) they got better, 2) they moved away, 3) they died. They indicated they felt they were feeding their efforts into a ‘cone of silence’. This lack of feedback on their actions seemed to contribute to a large extent to the feeling of futility and frustration amongst service providers. 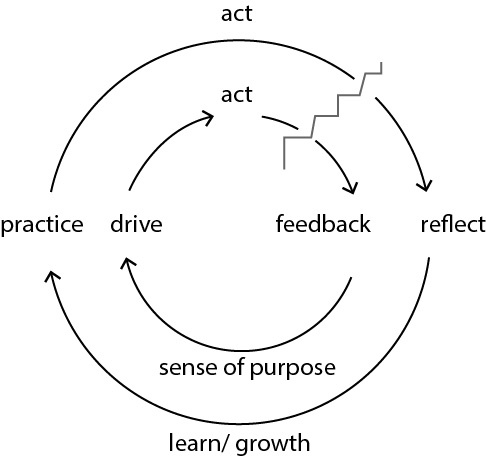 Not receiving feedback on your actions does not only affect your motivation to keep going, it also affects the extent to which you can learn or ‘grow’. If I am cooking a dinner for friends and they tell me honestly what they didn’t like about it, then I would be able to improve my cooking the next time. This also applies to the mental health service providers. They do not know how to get better at supporting people with a mental illness because they do not know if what they are doing now is good or not. Another related theme is ‘contribution’, the ability to collectively respond to someone who is in acute need for help. 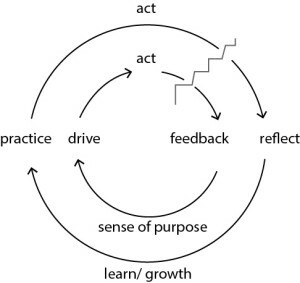 The themes ‘drive’ and ‘growth’ also feed in to this collective response. 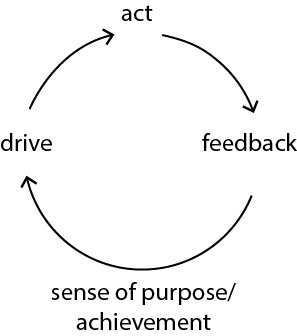 You feel more motivated to contribute to what a group or team is doing if you know other team members are motivated too, and as a group you can also learn about collective actions through a feedback loop. The next step in frame creation is to look for ‘frames’, new perspectives on the original problem. We did this by searching for other areas where the patterns we found in the themes of drive, growth and contribution come together. A useful frame came from one of the police officers who participated in the project. What if we would compare the mental health response to the emergency response in case of a bush fire or flood? This is also a collective response to a repeating emergency, and like the mental health crisis response it includes many disciplines including fire and rescue, police, councils and volunteers. However, as opposed to the mental health system, people who contribute to this emergency response gain immense sense of achievement and learn a lot through contributing. We then investigated what we can learn from this emergency response. One of the things we found was that there is a ‘local emergency management committee’ that is specifically aimed at closing that feedback loop. It is a multidisciplinary team that reflects on the last response, adjusts the strategy for a next emergency based on that response, and then feeds the strategy back to the people on the ground. Another interesting element is that they actively share positive stories of emergency response with the wider community. For example, they would publish articles on the work of volunteers in the newspaper, which would give the volunteers a sense of achievement. When we found this frame of looking at the problem as if it is about collective learning and motivation, we explored how this would map to the problem of supporting people with a mental illness. We quickly concluded that there was a need for some kind of committee comparable to the local emergency management committee. But somehow we felt that the word ‘committee’ was not really what we were looking for, as it tends to have a passive connotation. We therefore connected it to the idea of the coach of a sports team. A coach is someone who actively gathers knowledge of the actions of the sports team, and coaches the team to become better at what they are doing. The coach is the person who closes the feedback loop. Our new frame then became ‘the coaching team’, a multidisciplinary team of coaches. When we introduced the idea of the coaching team to the stakeholders and explained how it connected to the themes of drive, growth and contribution, we found that it became relatively simple to start talking about how this team should work. It is a cross-organisational local team of people who meet frequently to reflect on, and redesign collective mental health crisis responses. They feed new strategy back to the people on the ground through coaching. An interesting issue is that a coach of a sports team can directly observe what’s happening on the field, but members of our coaching team each only capture a small part of the complete journey of people with a mental illness. For example ambulance paramedics only know what happens during transport to the hospital. We therefore needed recordings of the complete journey from another source. When we asked people with a mental illness if they would like to share their (anonymised) stories voluntarily of going through an acute episode with the coaching team they were a bit reluctant at first. However, when they realised that through this they could contribute (!) to the mental health crisis response service and through that to helping other people with a mental illness they became quite excited about the idea. We also introduced the idea of sharing positive stories of crisis responses to the wider community, which service providers really liked, as currently the media only publish the most negative stories. This example shows that through investigating the patterns of themes (in this case drive, growth and contribution), and through subsequently looking for other contexts where we find these patterns (a sports team and a bush fire and flood emergency), we can develop frames (collective learning and motivation as in a sports team) and solutions (a coaching team) that meet the values that are shared by many of the stakeholders. It shows that creating innovative solutions can be achieved through a clear step-by-step method and is not just a mysterious skill that belongs to designers.